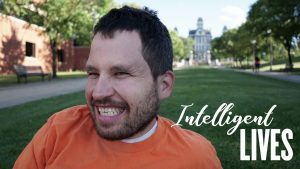 A friendly reminder that the Intelligent Lives Michigan premiere is right around the corner! Join us this Sunday, October 7, 2018 from 2 PM to 4 PM at the Berkley High School Auditorium. We are very excited to premiere this film starring Micah at Micah’s alma mater! Please bring your family and friends to this meaningful evening of Disability Pride, Inclusion and the Beloved Community. This is your chance to see Micah in Michigan before he flies back to Syracuse to work on Monday morning! Micah’s story is featured in this groundbreaking film that redefines and transforms our perception of intelligence and imagines a fully inclusive world. There is no better way to spend a Sunday afternoon in honor of Disability Awareness Month! Read More of January in Hawaii! © 2019 Micah Filka-Feldman, Dance of Partnership, and respective organizations and publishers. Website design by Allison DeVoe.